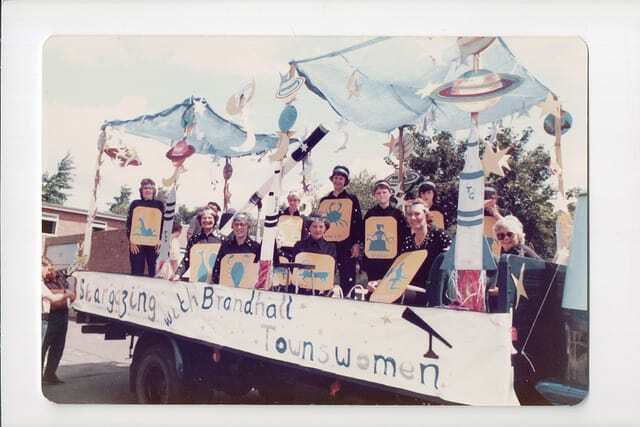 Jean and other members of the Townswomen's Guild on board a float depicting the 'Signs of the Zodiac'. Smethwick Carnival, late 1970s. 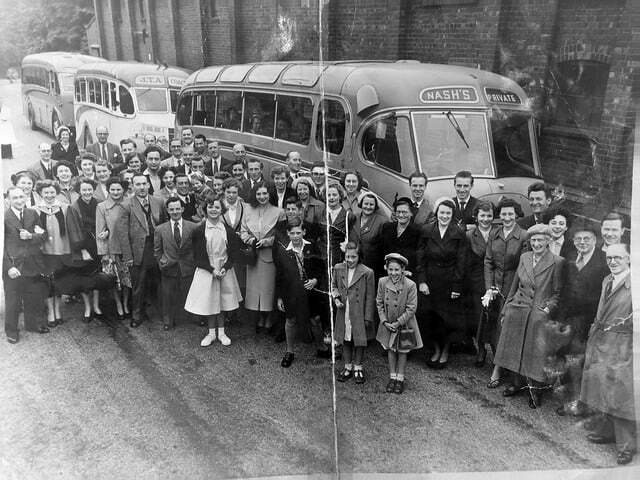 Jean moved to the Black Country from Hereford when she was three years old. She talks about her images of her father's work at Mitchells and Butlers Brewery, her time working at Payne and Griffiths and her involvement with Brandhall Townswomen's Guild. I was born in Hereford. 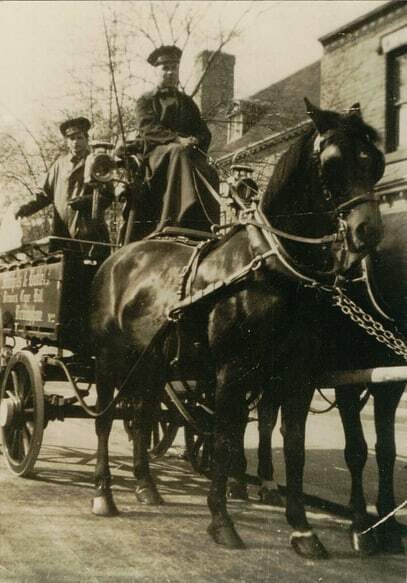 We moved here when Dad came to the Brewery in 1934 - he came up to look after the horses at Mitchells and Butlers. Probably he wanted a better life, he was always farming. He was based at Cape Hill, then he was a Fireman (at Mitchells and Butlers), then he ended up on the gate, looking after the people coming in and out, visitors coming in and out of the Brewery. He retired in about 1966. Do you remember when they did the horse shows in Cannon Hill Park? When we were kids he used to dress the horses, plait the ribbons and dress them up. It was always a big event in May Bank Holiday. It used to be hundreds of horses and carts and everything going round Cannon Hill Park. He won the prize for the best dressed outfit on first rubber wheels. The Dunlop prize for being on rubber wheels. They used to deliver, but he never got to drive the lorries because of his eyesight. He was in the Fire Service and he was the only one who never went to a fire! They used to leave him at home to make the tea for when they got back. I was just an office girl, I worked in the office at Payne and Griffiths, I went there in 1945, left to have my daughter in 1961 and then went back again for another 11 years after she started school. You did a works trip every year. All the works used to have a works outing, hadn't they? You wouldn't do it now. We kids used to go off all together. That was what it was all about really. Just having a day out and a bit of fun. It was a long way to go for a day back then. We climbed the Great Orme when we went as kids. My husband and I just met in the shop and that was it! I used to give him a job to do and that was it! I miss him now because I ain't got nobody to give a job to! My husband lived in the house next door (to Payne and Griffiths) as his Dad was the Works Manager, so they had the house next door in Windmill Lane. The whole family worked at Payne and Griffiths, the brothers, they all worked there. They were family firms then you know, weren't they? That was what it was all about. 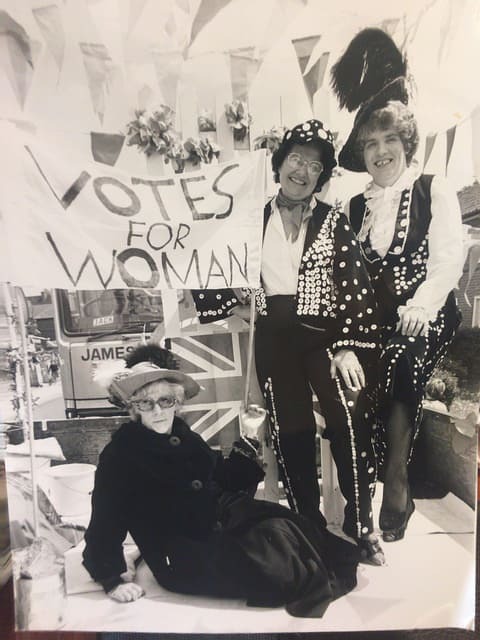 Members of the Brandhall Townswomen's Guild on board a float dressed in a 'London' theme at Smethwick Carnival, late 1970s. I belonged to the Townswomen's Guild, which is like the Women's Institute. From when we first started in 1967, I've done 50 odd years as a Townswoman. In the early days, we used to get involved in anything - dressing up and doing anything really. The theme for the Smethwick Carnival was London, so you've got all the old London things on there. That was taken in Victoria Park, end of the 1970s (image top left). Another one on the floats, we did all of the Signs of the Zodiac (image top right).